Could this be the kick start to a new era for second rows ? 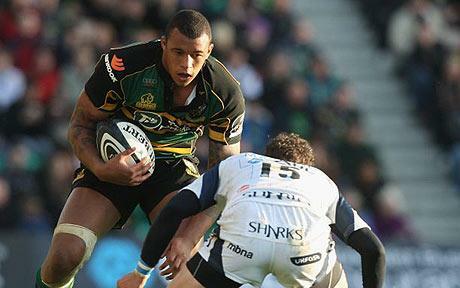 Courtney Lawes plays for Northampton Saints, he is only 23 years old. He represented England at under 18 and 20's level. Being very young, he has so much potential, his tackling technique is superb, being so tall and having the ability to hit low he pulls off his tackles well, he is obviously a natural athlete, and rugby player. He is lucky in the fact that he has natural speed also, well built to have a strong frame. Instead of being too tall, and pace being a disadvantage. Over all I can see him going very far, perhaps to be one of the first of his generation in versatile second rows hopefully. He also plays as a flanker, but ideally at second row, although he does make a good asset to any backrow. Joe Launchbury, physically he looks more like a overgrown center, but they way he plays is ferocious. He has speed and is flexible in contact. Being only 21, hes relatively new. Playing with Harlequins development squad and England u18s. In the Junior World Cup he was named England's player of the Tournament. He was then called up to England's first squad, making his debut against the Barbarians in 2012 as a sub. He was voted in December of 2012, the Aviva Premierships "player of the month". He shows great ability in the air in line outs, great carrying of the ball, reliable hands, and he shows off that he is an intelligent player, reading the game well exploiting space and attacking weak tacklers. He is versatile in that he plays flanker regularly but in my opinion he plays better in the second row. Together they can be a formidable pair, they are the ideal pair for each other. One being a strong head on kind of ball carrier, the other to run at the weak shoulder, they're both superb at tackling though I must say. I guarantee anybody, that in 3-5 years time, these two will be a devastating force to any line out, or open play attack, this will only happen when they both acquire experience. - Feel free to leave a comment !